If a week-long “tube count” of traffic is any indication, speeding is not a widespread problem on Albany’s Second Avenue S.E. There may be the occasional speeder, sure, but by and large the pace of traffic is pretty sedate. Tubes across the pavement of the two-lane eastbound one-way street, between Jefferson and Thurston streets, collected speed and traffic data from May 31 to June 6. 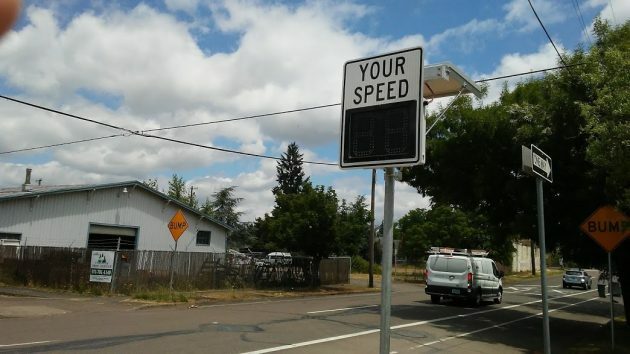 The goal was to establish a baseline before the city installed a temporary radar speed display. Now that the display is in place, another study later is supposed to show whether it has any effect in slowing traffic. The traffic volume during the study week was a little over 6,000 vehicles a day on weekdays, and around 4,000 on the weekend. The speed limit on Second is 25 mph. The tubes recorded an average or mean speed of 28 mph. That also was the median, meaning that half the drivers drove slower and the other half faster than 28. Only 15 percent of drivers during the period went faster than 33 mph. Of 39,547 vehicles counted, three were recorded going faster than 56 mph, with one approaching 70. But Ron Irish, the city’s transportation systems analyst, says that while it’s possible vehicles were going that fast, it’s also possible the counter was confused. That can happen when two side-by-side vehicles run over the tubes at close to the same time. I sat and watched the display for a few minutes at mid-day on Friday. The slowest reading I saw was 18, and the fastest 31 mph. Most of the rest were between 25 and 29. When the radar senses somebody going faster than 30, bright lights in the display start flashing. Traffic on Second comes in pulses, so sometimes there is no speed to be sensed or displayed. Flashing yellow lights. How Pavlovian! And those flashing yellow lights work so well a block over, where trucks are always crashing into the railroad bridge. I don’t have data in front of me, but it seems like the First Avenue trestle claimed about one vehicle per year during my time at the DH (1990-2015). Yikes, going 70 or even mid 50’s on Second Avenue is courting automotive disaster. One only has to look at the elevated railroad crossing just a bit further down the road to envision a car going airborne as it crossed them at speed. Perhaps, of course, that is what the motorist intends to occur? I’ve noted a Linn County Sheriff’s Office vehicle parked at a residence a bit further down Second, perhaps that might make theses errant motorists think twice about reenacting a scene from the “Fast and the Furious” on Second Avenue. Cars have gone airborne and ended up around that pole by the sheriff’s car in the past.